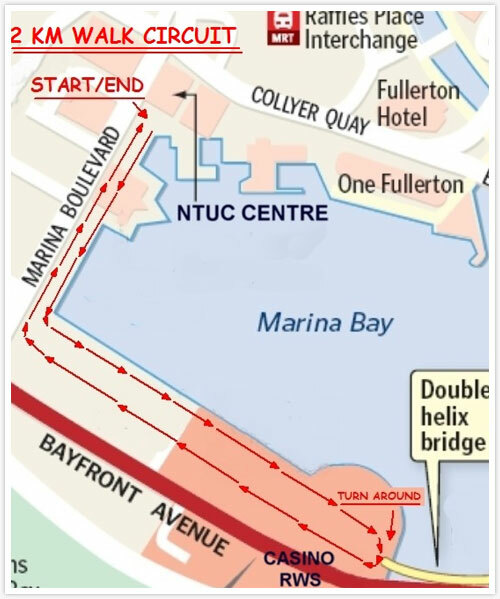 The racewalk committee invites walkers of all experiences and capabilities and also newbies, anyone and everyone else interested to learn about race walking, to come to the Marina Bay Promenade (see attached map) every Sunday morning, starting 12.06.2011, to meet up with fellow enthusiasts, to train or to be trained, to exchange training tips and generally have a good time. Sessions will start from 7.30 am and last as long as anyone is still around. All are welcome, young and old, experienced and inexperienced. Please contact Dr. Leong at this email for any queries.